Here's an update of the multivariate trading model I keep for SPY. 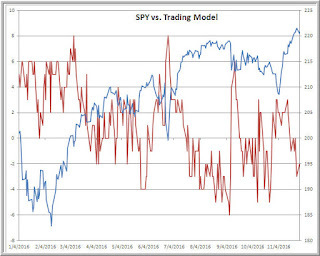 A number of variables go into the ensemble model, including buying pressure, selling pressure, breadth, sentiment, and volatility. Readings of +3 or greater and -3 or less have had particularly good track records in and out of sample, anticipating price change 5-10 days out. Note that we hit a -3 reading on Friday; prior to that we saw +3 readings shortly before and after the election. Thus far, we are not seeing significant breadth deterioration in stocks. For ten consecutive sessions, we have had fewer than 200 stocks across all exchanges register fresh monthly low prices. This breadth strength generally occurs in momentum markets; weakening of breadth--particularly an expansion in the number of issues making fresh lows--tends to precede market corrections. It is not at all unusual for momentum markets to correct more in time than price. We've seen selling pressure the past two sessions, but not significant price deterioration. This dynamic allows momentum markets to stay "overbought" for a prolonged period as price consolidates and often grinds higher.